The new year is basically around the corner, which brings about the "new year, new you" talk. So no better way to get your LIFE than with meal prep for 2018. Meal prep helps you get your eating habits in order, save money, and gain some time back in your life. 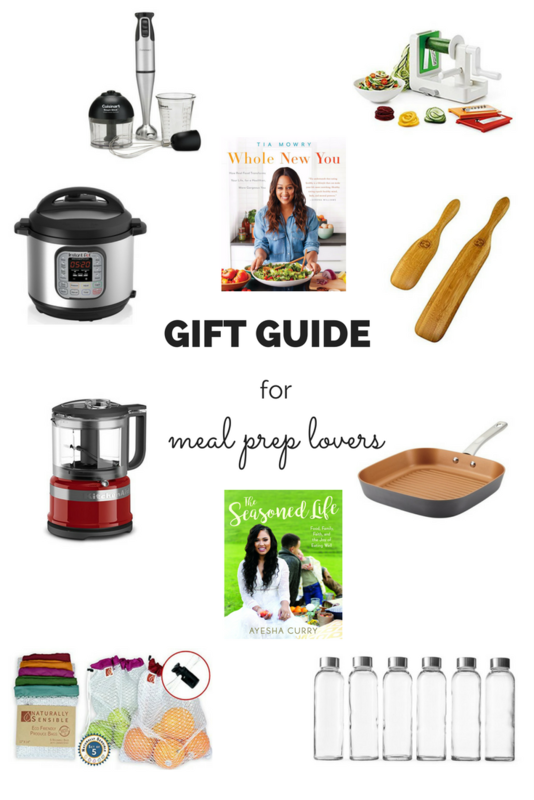 I've rounded up some of my favorite things to use in the kitchen for meal prep. Here's a gift guide to help you shop for the people in your life and yourself. 1. Cuisinart Hand Blender - I love using a hand blender instead of having to dirty up the blender. This allows me to blend right in the pot. One-stop cooking. WINNER. 2. Instant Pot - This is perfect for meal prep to help make quick and easy meals. I love the pressure cooker feature. 3. Kitchenaid Mini Processor - This compact tool is perfect for making sauces, dressing, and dips. These come in a variety of colors to fit your kitchen style. 4. Eco-Friendly Produce Bags - These are perfect for eliminating all of those plastic produce bags from the grocery store. They are reusable, washable and eco-friendly. 6. Brieftons Glass Water Bottles - I love glass storage anything. These are key when making sauces and dressing for storage it keeps them nice and cold. I just add little masking tape label and done. 7. Ayesha Curry Grill Pan - There is nothing like being able to grill through all of the seasons. Perfect for chicken breast, salmon, and vegetables. 8. The Original Bamboo Spurtles - I love this because they are just simple cool to have in the kitchen. The shape helps with scraping the sides and bottoms of your pans without causing damage. 9. OXO Good Grip Spiralizer - I absolutely love pasta but being feeling stuffed after I eat it. This is a perfect for creating noodles and ribbons of vegetables. If you are looking to cut back on the carbs in 2018, this excellent kitchen addition.